Scott Olson/GettyFast food workers and activists demonstrate outside the McDonald’s corporate campus on May 21, 2014 in Oak Brook, Illinois. 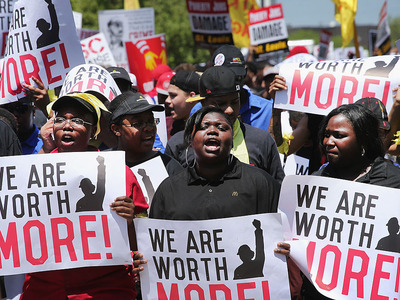 The demonstrators were calling on McDonald’s to pay a minimum wage of $15-per-hour and offer better working conditions for their employees. Several protestors were arrested after they entered and ignored police orders to leave the McDonald’s campus. McDonald’s is scheduled to hold its annual shareholder’s meeting tomorrow at the campus. A new rule from the Department of Labour, which will make many more workers eligible for overtime pay as of December 1, is rattling small business owners. The rule raises the salary threshold that makes workers eligible for overtime pay from $23,660 annually to $47,476. And while small businesses figure out the new regulation’s impact, they have slowed hiring, according to Philip Noftsinger, president of CBIZ Employee Services Organisation, which publishes a small-business survey of up to 4,000 companies monthly. “May was a deer-in-the-headlights moment,” Noftsinger told Business Insider. “Most of the companies I’ve talked to indicated that they put the emergency brake on hiring” and are conducting evaluations, from back-of-the-napkin calculations to detailed financial analyses, he said. The rule was not a shock to them and had been expected for a while. But the buildup to the announcement mid-May ramped up efforts to figure out what the impact would be. “It’s logical to think that if the issue was large enough to conduct an evaluation, it probably was coupled with a slowing in hiring,” Noftsinger said. In May, the pace of job creation suddenly fell to the weakest level in six years. Sure, a Verizon strike deleted up to 35,000 workers from the headline jobs number. Falling corporate margins are limiting how many people some companies pause about hiring. The weather may also have played a role. Noftsinger added that small-business concerns about the new rule had a direct impact on hiring. Of course, one of the usual caveats is that the jobs data are subject to revisions, which are sometimes substantial. Additionally, the question economists like Citi’s Andrew Hollenhorst grappled with was whether the jobs slowdown was a reflection of lower labour availability because the economy is nearing full employment, slowing economic growth, or temporary factors like the Verizon strike. To Hollenhorst, it was all three. Make that four, adding Noftsinger’s explanation. But the overtime rule will have some immediate and long-term benefits. The obvious one is better pay for thousands of white-collar workers, who are mostly women, and have at least a bachelor’s degree. Goldman Sachs economist Alec Phillips estimated a gain of 100,000 jobs because of the new rule. That’s because companies that want to avoid paying overtime could hire more workers and have them clock fewer hours so that old staff work less, too. “If the overtime rule can be managed by businesses and it doesn’t have a broad economic impact — it will have some impact but I don’t know that it would be broad — we should see labour numbers return to more reasonable levels given where the economic activity is,” Noftsinger said.